First a few pointers. The CB bracket is for small frame CB's. Don't try to use it for the king size models. The distance from the back of the CB to the mounting screw holes in the side of the CB should not be over about 3.25 inches. 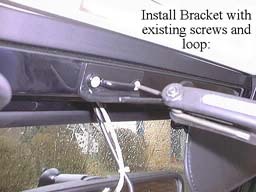 (I suppose a spacer could be devised to space the bracket out from the windshield frame to gain more clearance but I haven't tried this, nor would I recommend it.) 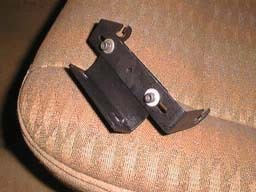 Also, if you're going to route the wires through the windshield frame, when drilling the holes in the windshield frame use a center punch to mark the drill site so the drill doesn't walk on you when you try to drill the hole. Remember to fuse the power supply to the CB! 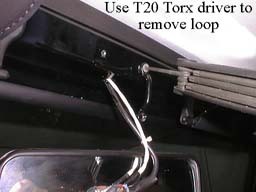 Leave plenty of wire, power and antenna, to work with at the bottom of the windshield frame. Prior to attaching the mount you might want to test fit the CB brackets. Also, due to the 1.326 quazillion types of brackets that come with the CBs you may have to drill a few new holes to match things up. To route the wires through the windshield frame drill a couple of 7/16" or 1/2" diameter holes as shown in the photos. Your hole size, (sounds obscene doesn't it), may need to be adjusted depending on the size of the wires you run. Don't drill any larger than you need to. Also, R.Shack has rubber grommets to line the holes and protect the wires but you could use silicone adhesive also. To fish your wires through the holes steal a length of nylon line off of your weed wacker and feed it into the top hole. Keep wiggling it, (you may have to pre-bend or straighten it a few times), until it makes its way to the lower hole. If you have trouble getting around the corner you can remove the sun visor and poke through the sun visor holes to help it along. 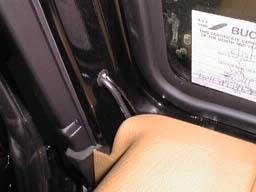 Once the nylon line is through the windshield frame bend the end back about 2 inches. Bend the ends of your wires back also and hook the two bends together. 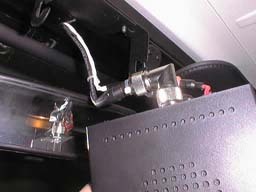 Use black electrical tape to tape the bends closed and thus hold the wires to the nylon line. Don't overtape or the wad won't fit through your holes! Also, make sure the tape is smooth and covers the ends of the wires and nylon line so they don't hang up. Now, pull the nylon line gently while shaking both the wires and the line. The wires should make it through the frame. Again, you can use the sun visor holes to help make the turn. You'll need to attach a coax connector to the end of your antenna cable and make the electrical connections, (I used spade connectors for the electrical connections so I could unplug the CB). Also, a coax elbow, (R. Shack again! 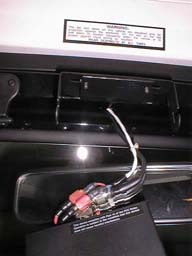 ), keeps the antenna wire parallel to the windshield. Any suggestions or questions would be appreciated. I know how confusing directions can be if you're not the one that wrote them.